Many businesses need a way to advertise and share information outdoors but want something that is portable, low-cost, long-lasting, up-to-date, and useful where traditional signs are difficult to use. Metal A-frame signs fit this bill perfectly! 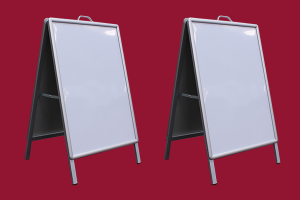 A-frame signs (also known as sandwich boards and A-boards) are a great, cost-effective method for instant advertising outside your business where traditional signage can be difficult to arrange.